There was a church here in the C11, possibly rebuilt in the C13, though the oldest visible work is C14 and little beyond the arcades and tower survived C18 and C19 rebuilding. 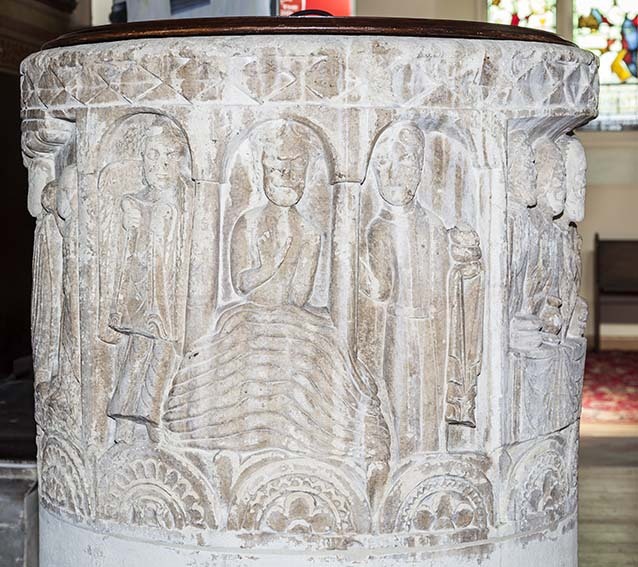 The fittings include a fine C12 font with carved figures and a C15 screen, as well as C19 work. 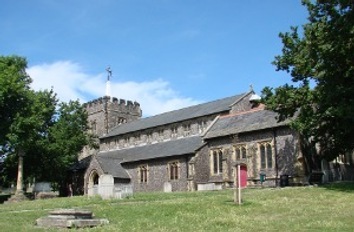 The original parish church of Brighton (in 1873 the title passed for 120 years to St Peter) is outside the confines of the old town by the sea, on a slope that today links it and the newer parts. Nothing of the church mentioned in Domesday Book (12,15) survives. The first church was probably of some size, possibly as long as the present nave, though not necessarily aisled. The VCH (7 p260) suggests parts of the chancel and south chapel may be C13, but nothing is apparent and Quartermain shows a C14 east window ((E) p3). It is evident from what remains that the church was transformed, if not rebuilt, in the C14. Work includes the now much repaired five-bay arcades of the nave, with octagonal piers and double-chamfered heads. The high bases may not be in their original state. Fragments of curvilinear window tracery found in 1853 (SAC 84 p140) show the previous aisles were also C14, though they were only half as wide as the present ones. The low west tower is also as it was built in the C14, though the upper part was substantially rebuilt in the C19 after it was found during the restoration to be cracked (1 p211). Its arch is like the arcades and the exterior detail, though obviously renewed, is plausible, with square-headed bell-openings, battlements and a tiny ogee-quatrefoil west lancet over a moulded doorway. The present buttresses are certainly entirely C19, though the Sharpe Collection drawing (1802) shows what seems to be a clasping south west one. Dale (p1) suggests it may incorporate earlier stones. The chancel arch is like the nave arcades and the west respond of that from the chancel to the south chapel has three clustered shafts, adding credence to the belief that the chancel was also mainly C14. A curious omission from the start was a clerestory, making the nave dark, though the lack made the squat tower more prominent. After the Reformation, as the population grew, galleries were added haphazardly. The aisles were mostly rebuilt with added dormers in the nave. Nibbs’s etching, made a year before the restoration, shows the result and corroborates Horsfield’s dismissive ‘a tasteless and unsightly edifice’ (I p141). Though not started until 1853, the restoration had been planned in 1846 by R C Carpenter (1 ibid), then working on St Paul’s for H M Wagner, who by then had been vicar for over 20 years. Wagner was initially frustrated in his attempts to raise money by levying a rate (the costs eventually came to £5921 (PP125)) by the many dissenters and radicals in the town (Dale p3), but the problem was resolved after the death of the Duke of Wellington in 1852, which led to a widespread wish for a memorial. It was decided to restore the church for this purpose, as the Duke as a boy had worshipped here (7 p202), whilst Wagner’s grandfather is said to have been the Duke’s tutor (6 p48) . H M Wagner himself had been tutor to his son and his presentation to the living in 1824 was largely thanks to the Duke’s influence (8 p48). Carpenter doubled the aisles in width, with square-headed windows with pierced spandrels, and extended the north aisle alongside the tower. The walls were refaced in dark flint and diagonal buttresses added to the tower (2 pl 1). He replaced the old roofs and thoroughly repaired the stonework, with a new east window of Decorated tracery. The south chancel arcade was altered from two arches to one and he added a north vestry. 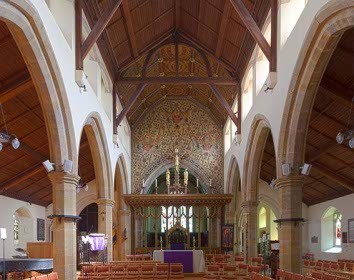 However, Carpenter did not provide a clerestory and, as Somers Clarke recalled (AR 44 p108), the wider aisles and removal of the dormers made the nave stuffy as well as dark. For over 20 years, Somers Clarke junior worked to remedy such deficiencies. 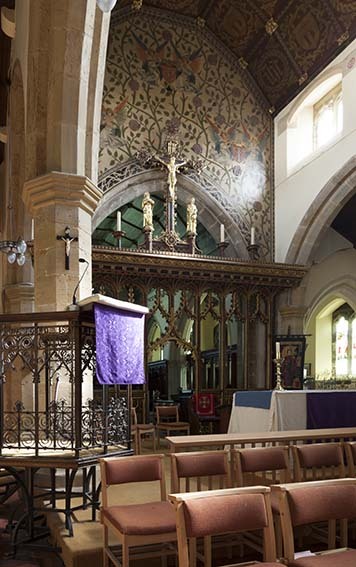 In 1876 he extended the north vestry and re-ordered the chancel, replacing its Minton tiles by panelling (B 34 p370). He probably designed the five-light east window of 1882 in place of Carpenter’s smaller one, now at The Annunciation. The most significant improvement was a new clerestory, started in 1886 (CDK 1886 pt 2 p144). This entailed supporting Carpenter’s roof on jacks whilst the walls were built up and at the same time the aisle roofs were boarded (6 p48). Finally, in 1900 Somers Clarke’s partner J T Micklethwaite widened the south chapel (CDG 84 p141) and reinstated a second arch to the chancel. As well as redecorating it, he repaved and improved the chancel. Churchyard cross: (by south doorway) Only the base of an undatable but pre-Reformation one remains, with a top placed on it by W H Godfrey in 1934 (6 p49). Font: Probably Caen stone. 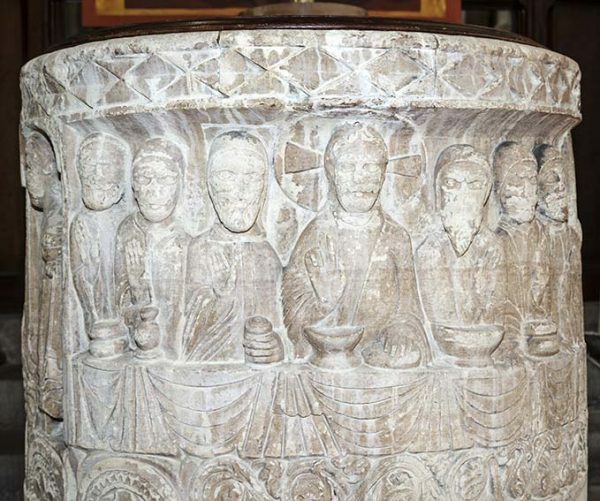 It is later C12, with two scenes from the life of St Nicholas, the Last Supper (with only six Apostles, perhaps for lack of space) and the Baptism of Christ, across three arches. 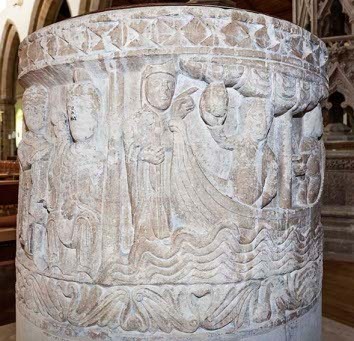 It has generally been held to be foreign and probably French and P M Johnston saw a similarity to a C12 monument at Fécamp in Normandy (5 p487) whilst George Zarnecki also suggested a link with Fécamp, though this has been questioned (www.crsbi.ac.uk retrieved on 1/4/2013). 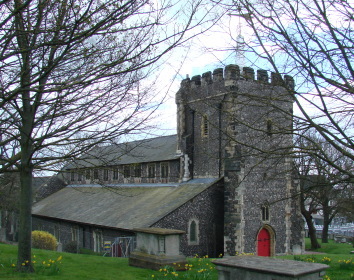 A link to Lewes Priory, which held the advowson by 1093, has also been suggested (VCH 7 p262). It was recut, possibly in either 1745, a date once carved on a curious base bearing the names of the churchwardens (shown on Horsfield’s engraving (I p142)), or in 1853. Font cover: J B Philip (Roscoe p978). 1. 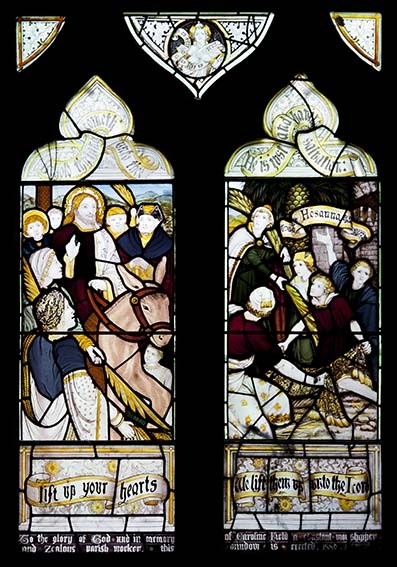 (East window) C E Kempe, 1882. 2. (Aisles and south chapel) A fine series by Kempe, mostly dating from 1878 to 1887. The designs are more pictorial and less stylised than much of his later work. 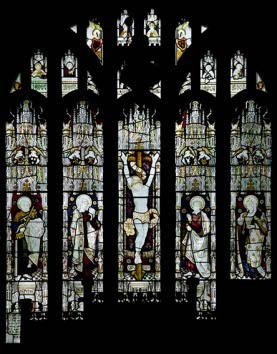 Though installed at different times, they form a sequence depicting the life of Christ, starting in the south aisle with the Annunciation, continuing in the north aisle with the Easter story and culminating in the Crucifixion in the east window. 3. (West window) C E Kempe, 1897. 4. Sir J N Comper, 1904 (Symondson and Bucknall p303). 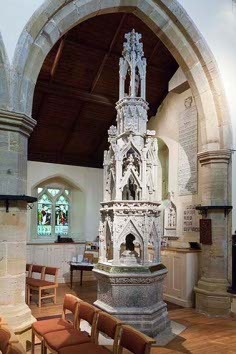 Despite the reputable source, this cannot be located, so either it has gone or the source confused it with other work by Comper known to be in the church (see under ‘Statue’ below). Lectern: Somers Clarke, 1885 (CDK 1885 pt 2 p152). 1. (Under west arch of south arcade) Duke of Wellington, tall like a mediaeval market cross with arcaded tiers, listing his victories. Erected in 1854, it was carved by J B Philip (B 12 p209) and stood originally in the south chapel. By 1882 it was in decay and was in 1900 moved to the north aisle when the chapel was altered (6 ibid). After cleaning and restoration, it was moved in 2001 to its present position (6 p49), where the top appears to have been truncated to fit under the arch. 2. (South wall of tower) John Pankhurst (d1795) and family signed by Williams of Brighton. it probably dates from after the latest death recorded which is 1811. 3. (North aisle) Frances Crosbie Fairfield (d1830). 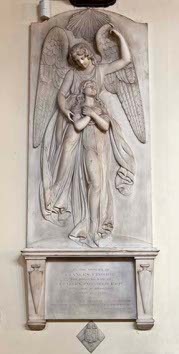 She is shown being carried up to heaven by an angel, signed by R Westmacott junior of Wilton Place. 4. (South aisle) Dorothy Westmacott (d1834) Marble bust on a volute, by her husband, Sir R Westmacott (Roscoe p1363). 5. Robert Gibbings (d1844) by J Carew,(ibid p197). 6. Mrs Crozier (undated) by W Pepper senior (ibid p970). 7. (Churchyard) Phoebe Hessel (d1821) ‘She served for many years as a private soldier in the 5th Regiment of Foot’. 8. (Churchyard) Martha Gunn (d1815) She was the most celebrated of the ‘Bathers’ of Brighton who made sure that every visitor had the proper daily dose of seawater. 9. (Churchyard) Nicholas Tattershall, Captain of the ship in which the future Charles II returned to exile after the Battle of Worcester in 1651. 10. (Churchyard) Amon Wilds, architect and builder (d1833). A sarcophagus with shell decoration, which has been plausibly attributed to his son, A H Wilds (Watney p33). 10. (Churchyard) Anna Maria Crouch (d1805) by E Coade (Roscoe p285), though Nicholas Antram points out that the urn on top is signed by W Croggon, who did not join Mrs Coade’s business until after 1813 and took it over in 1821 (BE(E) p165). 1. (East end and east wall of nave and in chancel) Designed by Somers Clarke and carried out by Kempe. Above the chancel arch are angels and foliage, now darkened and flaking. On the east wall the work includes embossed flowers. 2. 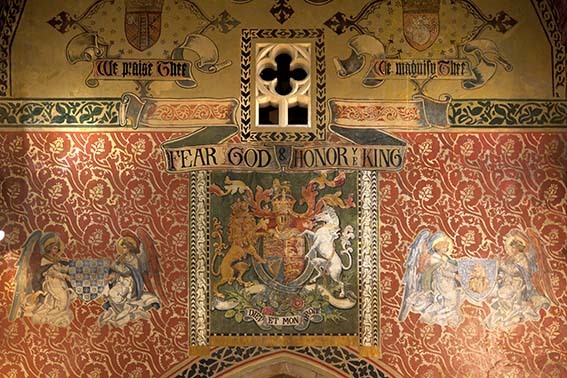 (South chapel) According to a painted inscription, the walls were decorated by H W Smithers (a former churchwarden) in 1894, but little else remains, probably because of the work in 1900. However, painted decoration on the roofs is also said to date from 1894 and may have survived later rebuilding. It could be by Smithers as well. Pulpit: Open ironwork, designed by Somers Clarke, 1867 (Dale p5). 1. 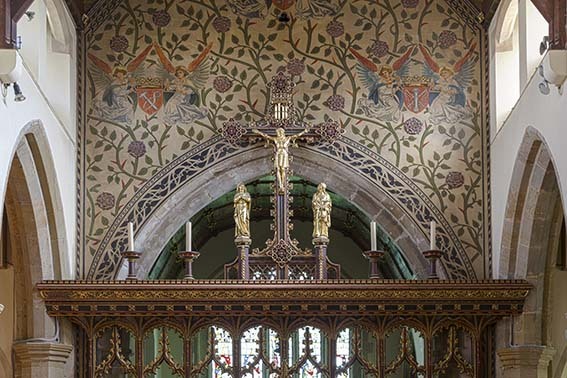 (Chancel) Probably part of Somers Clarke’s re-ordering of 1876, costing £230 and completed in 1880 with paintings by M R Corbet (CDK 1880 pt 2 p157). 2. (South chapel) J L Denman, 1909 (CDG 185 p83) and probably one of his earliest works. 3. (North aisle) Two painted boards with the Ten Commandments which look early C19 and were probably part of a reredos before 1864. Screen: There is at least one reference to a screen before the Reformation (6 p46) and the present one is probably C15, though restored, but it is not certain that they are the same. This present one is not in situ, for it is the wrong way round and in 1853 was found to have been cut down to fit. It has a central opening and three each side containing crocketed ogees. In 1853 it was missing the beam at the top, which was reinstated by Kempe in 1887, with new gates by Somers Clarke (CDK 1888 pt 2 p141). The rood above of 1892 is by the latter (SAC 84 p141). Statue: St Nicholas, Sir J N Comper, 1956 (Symondson and Bucknell ibid).